I have refereed NTC many times and don’t think I have seen them lose. There was no doubt about the winners in this game, Borough led from start to finish. That said game was close until two thirds way through, at which point Borough went from 4-3 to 6-3. Borough had set an early marker making a quick 2-0 start, NTC pulled back a goal to 2-1 but at no time in game was they level, they was always chasing. It was a credit to NTC that they stayed close for so long because Borough passing game was at a level expected of older players. I could name two players who was outstanding, but will abstain as this was a team performance deserving high praise. Both keepers made several goal stopping saves, futsal keepers are continually in the firing line, every mistake is magnified as they can be so costly; these two lads had parents applauding on many occasions. Game was a pleasure to referee and also to observe with a coaching hat on. Rare feature in this game was my awarding a ‘free 10 meter shot’ to Immingham. Free kick was awarded after Borough accumulated 4 second half fouls. By laws 5th foul and after is a free shot at goal. None of the fouls was serious fouls, but all in ‘my eyes’ warranted a free kick. From memory all the fouls was players over zealously tackling from behind the player with the ball. 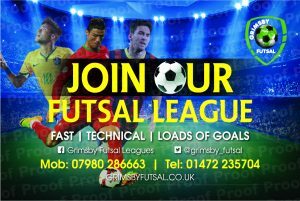 Experienced futsal will tackle ‘side on’. Football has no foul limit, futsal players have a cut off point, after that no matter where on the field the foul, the results the same, a 10 meter penalty is awarded. For a 10 meter penalty the keeper can stand up to 5 meters off his line. My experience is it’s 50/50 if you score from ten meters. 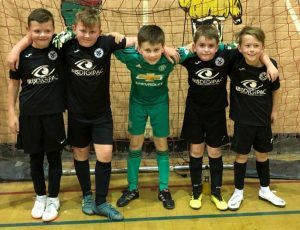 This entry was posted in Grimsby Futsal League on November 27, 2018 by Kevin Bryant.